When European elites speak of their fears surrounding the migrant crisis, it isn’t demographic change or rising crime they mention – but the political right wing which offers an alternative. Speaking to the BBC on Wednesday, European Commission vice president Frans Timmermans expressed deep concern about political developments in Europe in reaction to the migrant crisis. He told the British state broadcaster: “If we’re not able to find sustainable solutions [to the migrant crisis], you will see a surge of the extreme right across the European continent”, reports The Independent. It is little wonder he’s worried. Timmermans is a former Dutch Labour member of parliament, and in his native Netherlands as elsewhere his political party suffers as the native people of Europe grow increasingly tired of the migrant crisis. Geert Wilders’ party for freedom holds a strongly anti-immigration stance, and the centre-right party for democracy is keeping Labour in opposition. Just to the north in Denmark, concern about migration has become so developed that the national liberal party is cutting benefits for migrants and placing adverts in foreign newspapers telling people not to even bother coming to Europe. Immigration and integration minister Inger Støjberg, perhaps the most hard-line member of the government is, according to a new opinion poll, now the most popular politician in the country. Yet further north in Norway, the fear of democratic expressions of disquiet with mass immigration are also ruffling feathers within the corridors of power. The national intelligence agency made a report this week stating that the greatest threat to Norway from mass migration was not migrants themselves, but right wing political parties – echoing Timmermans’ own words. In a remarkable admission, the Norwegian intelligence services stated: “Asylum seekers linked to radical Islam are not a main concern to the PST in the short-term”, reports TheLocal.no. “The increasing flow of asylum seekers in Norway could, first and foremost, have negative consequences on threats linked to far-right circles in Norway. This is because hostility to immigration is one of the main issues, and an important mobilising factor, for these circles”. Compared to many other European countries, Norway has received comparatively few arrivals during the great migration, but this is changing. Although it has until now benefited from standing at a great distance to the main flashpoints, many migrants are now no longer seeing multicultural paradise Sweden as such a safe or desirable destination and are continuing north to Norway and Finland. 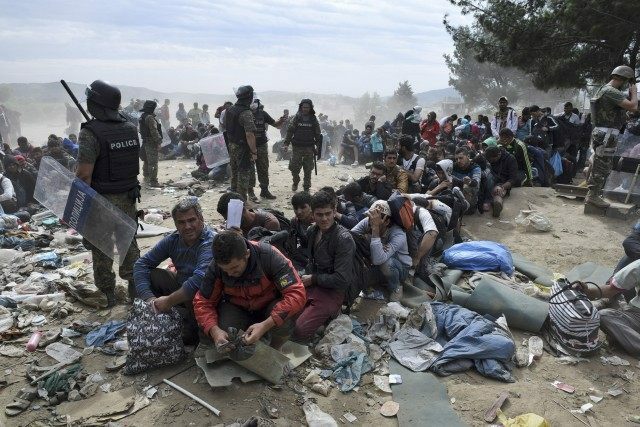 Some 8,000 have arrived in Norway this year, but the figure is rapidly rising. The government expects some 20,000 by the end of the year – or 4,000 a month for the next three months. The Finns have taken less – and taken less kindly to their arrival. Breitbart London reported this week on the welcoming committee that met one bus-load of migrants making its way to an old military base, converted to an asylum centre. Locals threw stones and fireworks while carrying flaming torches. At another immigration centre on the same night, molotov cocktails were thrown. There have been three arrests.